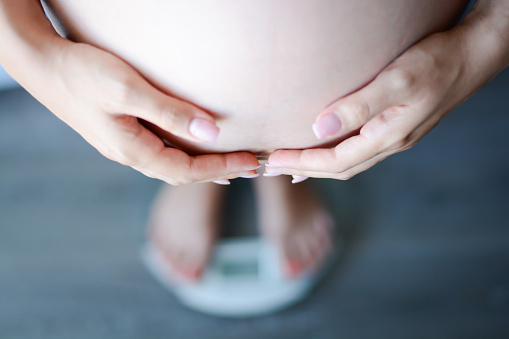 Weight gain is a common side effect during pregnancy. That being said, unhealthy weight gain can lead to postpartum weight retention. In a new multi-ethnic urban population study published in the American Journal of Clinical Nutrition, researchers at Columbia University’s Mailman School of Public Health have made a first-time discovery about the link between long-term weight retention and body fat and weight gain during pregnancy—also called gestational weight gain. The results suggest that excessive weight gain during pregnancy has a long-term effect in women who are slightly overweight or of normal weight before getting pregnant. For the study, the researchers collected data from 302 African-American or Dominican mothers who had enrolled in the Columbia Center for Children’s Environmental Health Mothers and Newborns Study in Northern Manhattan and the South Bronx between 1998 and 2013. Researchers discovered that mothers with excessive pregnancy weight gain had greater body fat percentages seven years after their babies were born, especially when they began pregnancy at either a normal weight or slightly overweight. In the study, the researchers found that before pregnancy, 22% of the women were obese, five percent were underweight, and 53% were of normal weight. Overall, 64% of the mothers gained more weight than recommended. What’s also interesting is that 38% were obese seven years after giving birth. Also, the mothers who had not been obese before pregnancy and had excessively gained weight increased their risk of obesity by 400% after the seven years. It is typical to gain three to four pounds during the first three months (first trimester), eight to 12 pounds during the second trimester, and 13 to 20 pounds during the third trimester. According to the Institute of Medicine Guidelines (IOM), it is recommended that underweight women gain an average of 28 to 40 pounds, overweight women should gain 15 to 25 pounds, and obese women should only gain 11 to 20 pounds. It is thought that despite the guidelines, most women gain more weight during pregnancy than the recommendations. Eating healthy meals allows for steady weight gain during pregnancy, while giving the baby proper nutrition at the same time. It is a good idea to eat plenty of vegetables, grass-fed meats, and healthy fat sources like extra virgin olive oil and avocados. Whole food sources should also be organic whenever possible. On the other hand, unnecessary weight gain will come from high consumption of processed and fried foods that are full of empty calories. “Unhealthy pregnancy weight gain tips the scales for mothers even years later,” ScienceDaily web site, October 22, 2015; http://www.sciencedaily.com/releases/2015/10/151022141705.htm. Widen, E.M., “Excessive gestational weight gain is associated with long-term body fat and weight retention at seven-year postpartum in African American and Dominican mothers with underweight, normal, and overweight prepregnancy BMI,” American Journal of Clinical Nutrition 2015, doi: 10.3945/ajcn.115.116939.